Ted, a resident of the assisted living center The Terraces, was the first of a group of seniors waiting in line to don a virtual reality headset, and he gripped the hand controls as if they were poisonous snakes. Prompted by Danielle Worthy, a library assistant for the Bown Crossing branch of the Boise Public Library, Ted said he saw some fish and a stingray. “What do you think?” asked Worthy. Ted was using a deep sea diving simulator called theBlu, and the rest of the residents tried other simulators in turn. Darlene chose Richie’s Plank Experience, in which she rode an elevator to the top floor of a building. The doors opened, and she was greeted by a pirate ship-style plank suspended 525 feet above a city street. Rather than walk the plank, she pressed another button that took her down to the “fire deck.” Her fellow residents watched on a laptop screen as the doors slid open to billowing digital flames. This late-January event wasn’t the first virtual reality demonstration at The Terraces, and it won’t be the last. The trend began in early 2017 when a woman in hospice care at the facility used the technology to ride on the Trans Canada Railroad, checking an item off her bucket list and alerting the staff to the promise of technology. Trips to the Bown Crossing library branch for residents to use its headsets may soon become a regular occurrence for the seniors, though this time the library came to them. In years past, people would put on cumbersome equipment at video game arcades to immerse themselves in poorly rendered 3D environments, paying extra for the privilege, but a high-tech breakout was on the horizon. In 2014, Facebook bought VR startup Oculus for $2 billion. Oculus offered a suite of headsets, cameras and controllers that was expensive ($600), and required a powerful computer to render high frame rates and detailed 3D graphics, but other companies, including HTC Vive, PlayStation, Samsung Gear and more, quickly jumped on the VR bandwagon. The decreasing cost and widening availability of the technology is slowly bringing virtual reality to the mass market, where it’s now used for work and play. Architects and engineers, for example, use virtual spaces to design structures. At the same time, the Boise Public Library and one Boise-area virtual reality arcade have discovered VR is a gateway for people of all abilities to play and learn. Located in a suite in an Eagle strip mall, VR1 is the only virtual reality arcade in Idaho, and one of only a handful in the United States. From the outside it’s unassuming, occupying a narrow space between a German restaurant and a salon—a space designed more for a travel agency or a smoothie bar than a cutting-edge commercial entertainment center. VR arcades are popular in China, and the technology is part of the 2016-2020 five-year economic development plan for the country. By contrast, VR1, which celebrated its first year in business in February 2018, is one of a handful of arcades of its kind in America. Smythe said he expects them to become more prevalent in the U.S. over time, but added that he has tailored his business for an emerging, rather than an established, market in Idaho. VR1 has a range of programs available to customers at a base rate of $25 for 50 minutes of headset time. Users put on the headsets, grab a pair of controllers and navigate the launch menu, which includes approximately 50 “experiences,” ranging from hot titles like Batman: Arkham VR and war games like Onward to sports simulators like Fancy Skiing VR and arts programs like VR Museum of Fine Art. Smythe has made his arcade a place where people can participate even if they’re not wearing headsets. There are tables and chairs near each station where people not plugged in can watch the action on large TVs, and the arcade has become a hotspot for family gatherings and students looking for something to do with friends after school. Brendan’s sister, Talya, who works at VR1, said trips to the arcade can be family events even if only a few members of the family actually enter a VR simulation. Brendan has made VR1 accessible to all comers, and clarifies on the company website that many of the games, programs and applications there are suitable for a variety of users’ physical and intellectual abilities. There are, however, some medical conditions that can limit the use of VR. People with heart conditions or seizure disorders should consult a doctor before trying the technology, and there are documented instances of people with epilepsy having seizures while in a virtual setting, though that hasn’t happened at VR1. 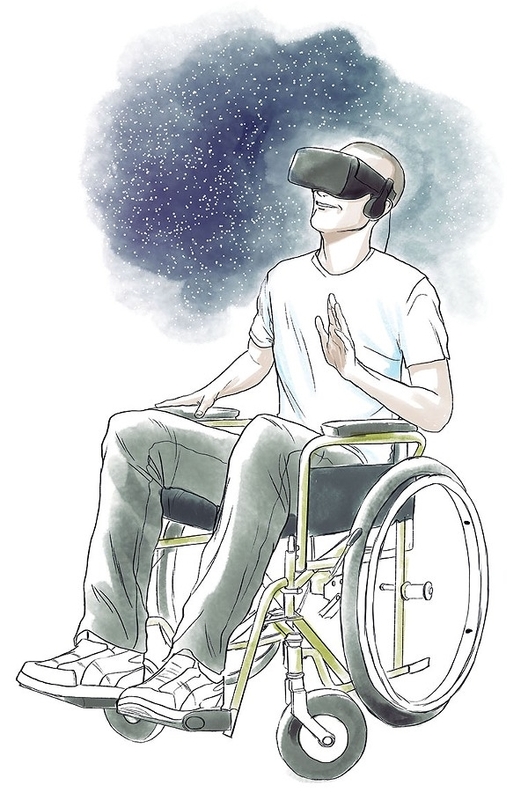 There have been many more examples of customers with cognitive disabilities blossoming under the headsets; people in wheelchairs, for example, have discovered new mobility by leaping through a virtual world at the pull of a trigger.” One elderly customer used Google Earth to visit his childhood home. He pulled off his headset and exited the booth in tears. Another patron, who was extremely shy, relaxed enough that his stutter temporarily vanished. Talya said she’s seen many breakthroughs first hand, but it’s the small achievements—getting someone to try VR out for the first time, or overcome some reluctance—that excite her. Sometimes, she said, getting customers there requires some assistance, but once they’re in a virtual world playing games, watching movies or learning about art, they acclimate quickly. “We show them that it’s OK, and once they have the headset on they can find something they can really enjoy,” she said. In much the same way VR1 is a spinoff of the classic 20th-century video game arcade, the virtual reality technology available at branches of the Boise Public Library is an extension of its broader mission of equitable access. For Worthy, who helped the seniors at The Terraces, it’s about “meeting people where they are.” On her trip to the assisted living facility, she borrowed a mobile VR unit used for visits to schools, community centers and events outside the library walls, but every library branch also has its own in-house VR unit. BPL rolled out its first VR units in early March, 2017, as part of Boise Codes, a push to increase citizens’ technological literacy that emphasizes using virtual reality, along with online, coding and “maker” technologies like 3D printers and laser cutters, for professional development. The BPL Main Branch now boasts a full Boise Codes Lab with grass green walls and an open layout divided in half by a strip of tape. A bank of 3D printers takes up half of the space, while the VR unit, including a headset suspended from the ceiling by an iron chandelier-like overhang, fills the other side of the room. Still, Boise Codes is more than the equipment lining the walls. It’s also a suite of resources for developing digital and tech skills through online services like Lynda.com, Treehouse and Safari—resources that may be vital to helping some users enter new fields of employment or enhance their skill sets. To that end, BPL Information Services Librarian Eliza Ruby said the library is fighting to eliminate computer illiteracy and “bringing [learning] resources to people.” The lab is frequented by entrepreneurs, engineers, students, professional climbers and library users looking to pass the time. “This room, as great as it is, can get a little cramped,” she said. VR time in the lab is managed in much the same way, and users can sign up for time slots online to use any of the nearly 50 programs available. Many of those programs are games, like the aforementioned Richie’s Plank Experience, but a significant portion have educational, artistic or scientific applications. There are work simulators, whole museums and drawing programs. One of the arts programs, The Night Cafe, allows users to explore virtual environments styled after the works of Dutch artist Vincent van Gogh. Even the games, however, help build users’ confidence with the technology, and a patron riding a virtual roller coaster one day may start learning how to code the next. Virtual reality is still fairly new to the BPL, but Ruby said it fits neatly into the library’s service to the community.